Beautiful, chic and set apart from the sister hotels, the Jetwing Lagoon hotel in its own private island surrounded by the tranquil waters of the Indian Ocean on one side and the glorious Negombo Lagoon on the other side. Designed in an architectural magnificence, with impressive facilities that are the main focal parts of the hotel. 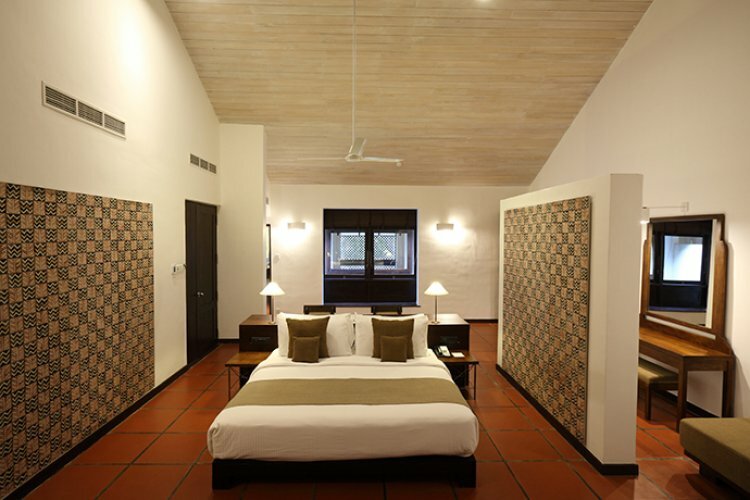 All rooms are stunningly designed with a real Sri Lankan style complemented with modern furnishings, boasting very spacious and gorgeous views of the pool or the ocean. With 5 different room types on offer, equipped with luxury and state of the art facilities to ensure guests the finest and sumptuous stay at the Jetwing Lagoon. Featuring 2 exceptional restaurants, offering a diverse flavours for choice and showcases the heritage of Sri Lanka's multicultural cuisine. Enjoy traditional, hearty homegrown Sri Lankan food at the Geoffrey's Pavilion, or for BBQ treats, dine at the Casual Dining at Blue Lagoon where they have tantalising dishes that would sure satisfy your taste buds. Relax and enjoy exotic cocktails and drinks by the poolside from the 2 bars available. For a haven of serenity, the Ayurveda Spa offers the finest practice of natural medicine and therapies where the well-trained staff are there to provide the utmost harmony to the mind, body and soul through a variety of treatments. Boasting a unique and vast swimming pool that is one of the largest in the west coast of Sri Lanka or revel in the range of water sports that are available. Four star, elegant accommodation that is an ideal getaway to relax in complete privacy in the finest, hotel on the West Coast of Sri Lanka.